Let’s Rock @ Cowan Street, Ipoh – Relocated. Reloaded. Rock On. What used to be Tai Ka Lock, became known affectionately as Tai Kar Rock, to something more contemporary … Let’s Rock. Tell that to a foreigner and none would have expected Yong Tau Foo and curry fish head to be the stars. And right after the revisit to the revamped Italia Mia (changed owners, same premise, same name), we proceeded to try our luck at the ‘new’ Let’s Rock on Cowan Street. Can’t brand this as new though, as aside from the new location (they were from the next street – read previous review HERE), nothing much has changed. The premise got more spacious now and the place opens until so late at night; giving the pubs within the vicinity a run for their money. Or the relationship could be symbiotic. The Rockin’ Apom …. 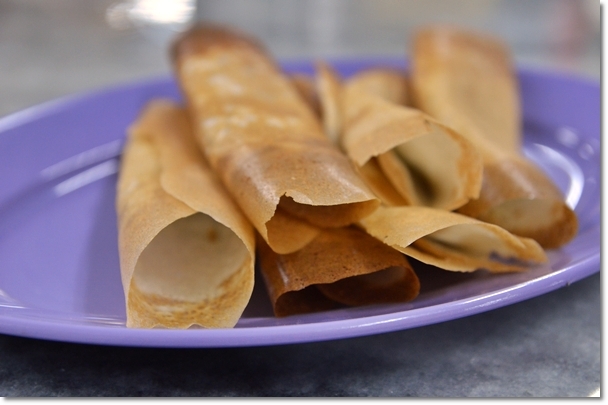 at RM2.00 per 6 pieces of flour perfumed by coconut milk (santan), these were gone in mere seconds. We got carried away and waltzed in leisurely during peak hours on the first night. Lo and behold, we were seated at the very end of the shop; with about thousand tables waiting for their food. It sure felt like that, with dagger eyes staring right through each other with conversations coming to a halt; possibly owing to the delay in satiating their hunger. And so we left for something else. Then the adamant family of gluttons (yeah, never quitters when it comes to FOOD) returned the night after; towing along the almighty hungry Grandma’s (two of them, and they’re gorgeous little eaters, I kid you not) for the feast. Thankfully, the place was half-empty …. and food arrived within minutes. They’re quite efficient, actually. 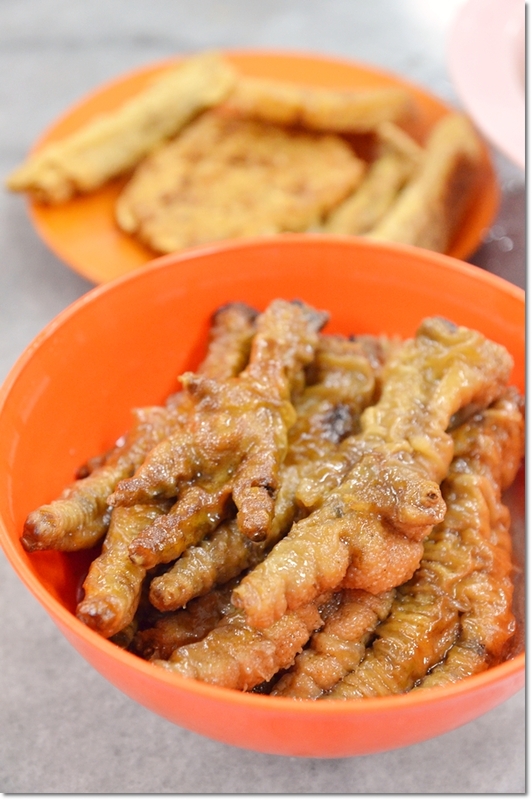 Braised Chicken Feet; gelatinous goodness in every bite … or slurp, or chew. Just remember to spit out the tiny bits of bones. 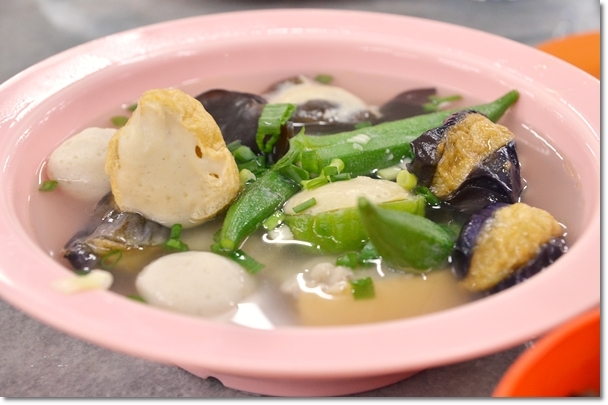 There are 3 stalls there now; an apom stall, a curry fish head stall also under the same management of Let’s Rock and of course … the perennial favourite food of many; a stall selling fish ball noodles or ‘liew fun’. Ultimately, ordering’s all done at the counter. Walk over and pick your favourite pieces of stuffed fish paste. The choices are aplenty, yet not as extensive as the one in Gunung Rapat and the fried stuff not as sinfully tempting as the ones at Big Tree Foot. 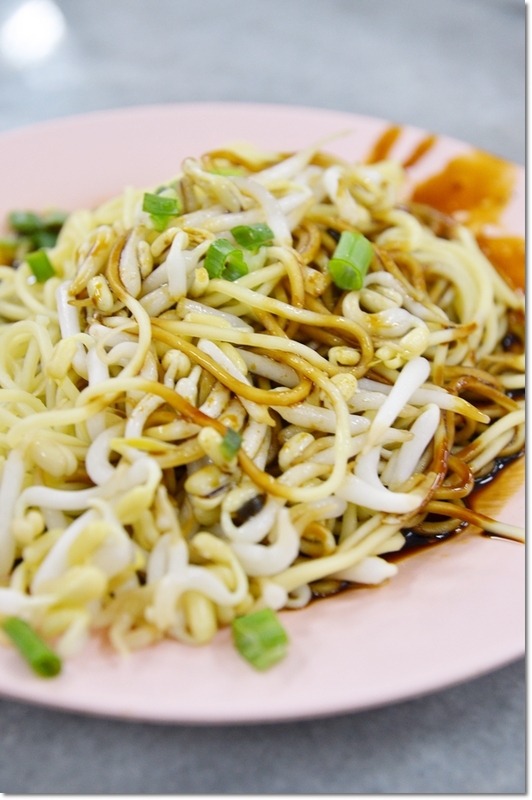 “Kon Lou” Yellow Noodles with crazily plump Ipoh bean sprouts. Just look at the size of those compared to the noodles! The stall parked in front of the premise offers a pot of scary-looking chicken feet braised in soy sauce, but to those suckers (literally) of soft, gelatinous and melt-in-mouth texture of the braised limbs, the pot’s like gold. 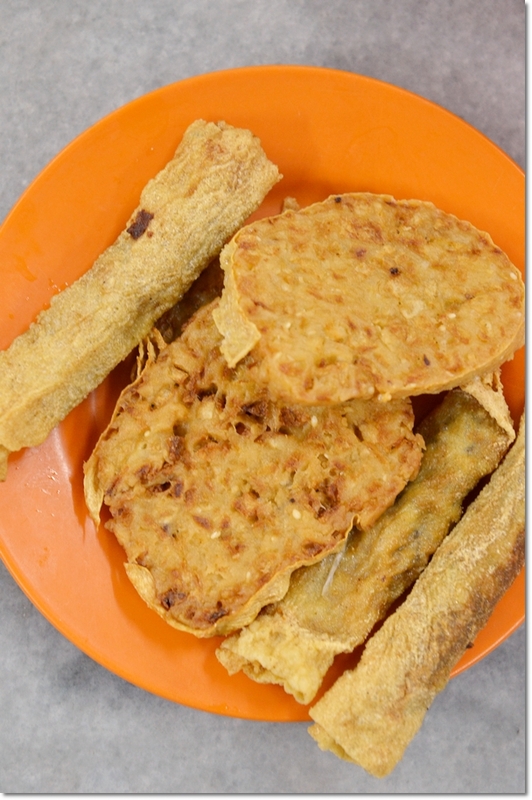 All “Yong Liew” (that’s how we locals call the otherwise widely known as “Yong Tau Foo” to the ones from other states) are priced at RM0.60/USD0.20 each, with the fried prawn rolls at RM1.00/USD0.35 each. Very reasonable, as compared to the ones here in KL/PJ, you probably cannot find anything less than RM0.80 per piece. Those crispy, deep fried rolls were very good; a combination of fish, prawn and pork paste I believe, but to a right degree of taste and texture. The “Sar Kok Liew” (stuffed yambean) however, failed to impress. For the old ladies in the entourage, nothing beats a savoury stock with bobbing pieces of stuffed brinjals, bitter gourd, okra, and beancurd immersed. My taste bud could have been jaded. Or maybe I was expecting so much more from this easily most famous “Yong Liew” stall in town at night. The pieces of stuffed ingredients did not register deeply in the mind, aside from the fried chicken and prawn rolls. 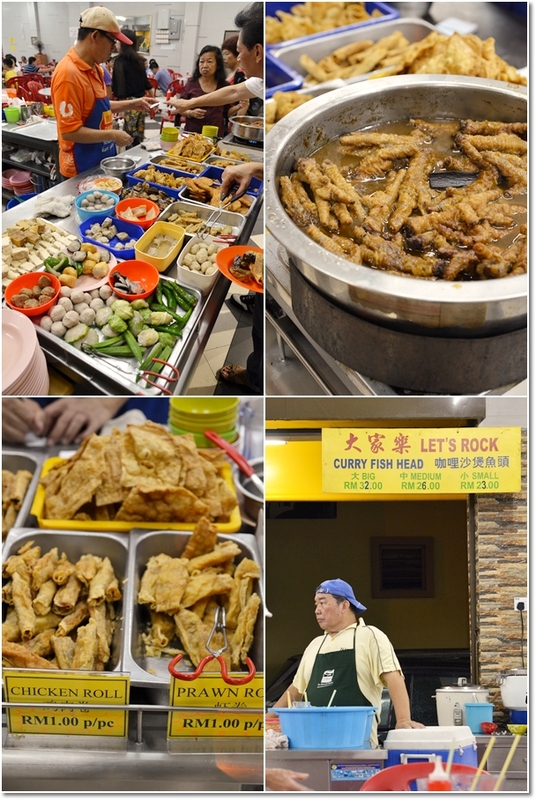 Don’t get me wrong, the boiled stuff were good, but far from being a die-die must try outlet for delicious ‘Yong Liew’ in Ipoh. 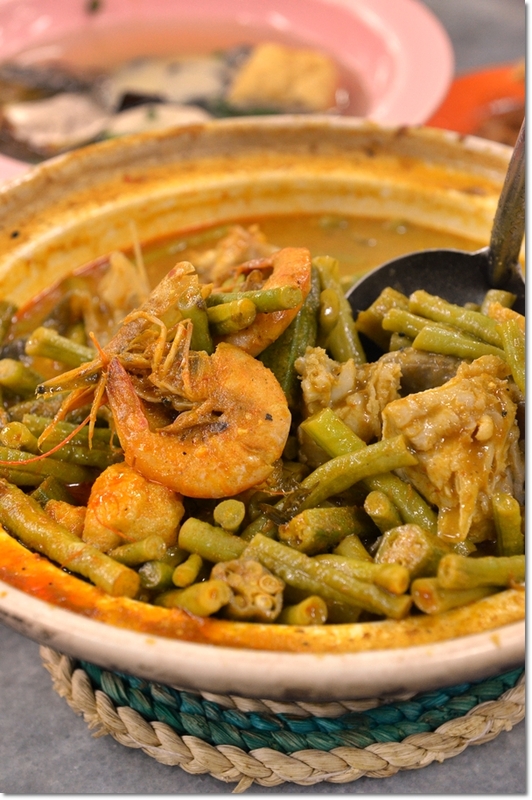 An awkward offer; Curry Fish Head and Prawns with tonnes of long beans and okra, with pieces of tau fu pok to soak up the gravy (S = RM23, M = RM26, L = RM32). Curry was okay, a definite hit if you’re a fan of curry and rice. But the fish head and prawns came in minimal portions. Almost 1Malaysia. 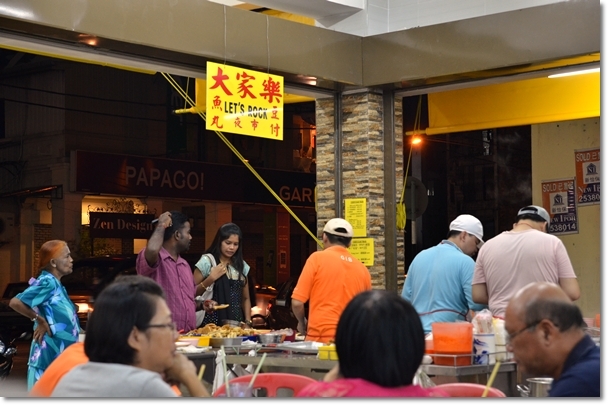 This was on the evening of Thaipusam, and right in the middle of our dinner, they closed off Anderson Road for the procession. Talk about timing. This could be a place that can go far. Far beyond the tourist crowd come long weekends and public holidays. I believe not many places in Ipoh sell “Liew Fun” at night, aside from this Wok With Kim on Yang Kalsom Road and this hidden gem in Pasir Pinji wet market. *At this time of publishing, Motormouth is actually somewhere out of the country. Eating my heart out and letting the ingrained gluttony nature takes over. So pardon me in case I reply slower to the comments. Diagonally opposite of Koh Samui Thai Restaurant, and directly opposite of Papago shop; at the turning towards Excelsior Hotel. A short walk away from Cowan Street Famous Bean Sprout Chicken. Oh my, that pot of curry fish head has more Long Beans than anything else – they should re-name it Curry Long Beans, hehe! I would say, about 20 minutes away? Not that far actually. You can get to most places around Ipoh in half an hour or less. failed miserably. too salty and agreed by all 5 who ate there. period. Salty? Not really. But to us, the ‘liew’ and the noodles and chicken feet were just …. so-so at best. Was much better at the other outlet on the next street.